The craft-beer and real ale scene has certainly seen a recent boom in the capital. 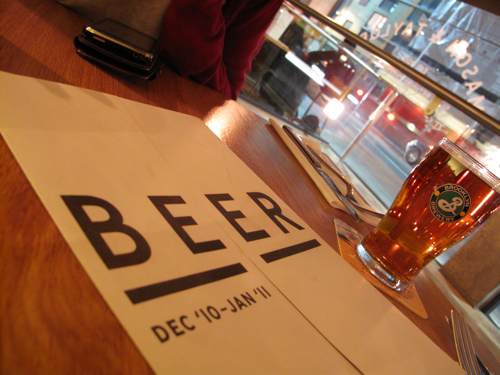 With that has come the emergence of more and more specialist beer pubs such as the Draft House and Euston Tap. It’s immensely exciting to see new, stand-out brews made on a smaller scale with tender loving care… a breath of fresh air and welcome change from the generic, mass-produced Anheuser-Busch-empire-kind. On that note, I’m happy to report that there is a new East End establishment to add to the list of flag-bearers for the artisan beer and micro-brewery movement. Located at the top of Brick Lane on the site of what was formerly Green and Red Cantina, Mason & Taylor is a beer-lover’s dream come true. With a seasonal menu that boasts 12 seasonal craft-beers on tap and over 40 bottled varieties from all over Britain and beyond, I had the feeling I was a 6 year old child in the sweet-shop all over again. There’s everything under the sun here from Crisp Lagers and White Wheats, to Golden Ambers and Trappist brews, to Dark Ales and Creamy Stouts. I’m particularly partial to the Camden Pale Ale and Brooklyn Lager they have on draft here. The Pale Ale is pure and clean-tasting with woody flavours of keg and orange throughout. The Brooklyn is everything I look for in an Amber – a beautiful golden colour, deep flavours of caramel, malt and a wonderfully long finish. The British fare on offer here ranges from pub-grub classics such as English rarebit to more inspired options such as Rabbit and Crayfish terrine, all served up in smaller ‘tapas’-style portions that are perfect for sharing over a pint (or three). 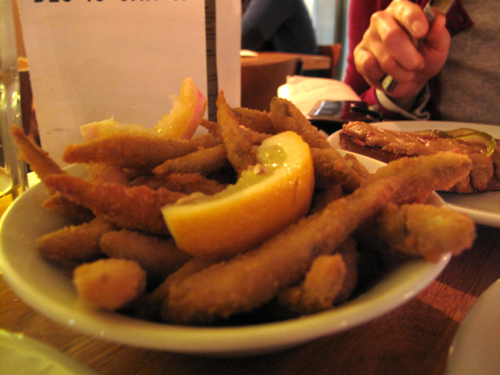 First to arrive was deep-fried Whitebait which was cooked in a light, well-seasoned batter and served with a couple wedges of lemon. Simple, but delicious grub. More interesting though were the Pickled Ox Tongue and Wild Boar sausage dishes. 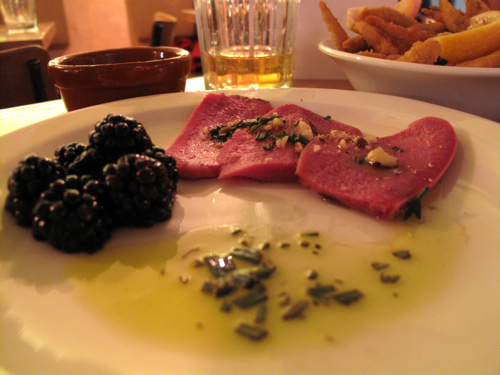 The combination of springy, savoury Ox Tongue and juicy Blackberries was an interesting balance of flavours and textures. We did find the Rosemary oil a little overpowering though and ended up leaving most of the on the plate. 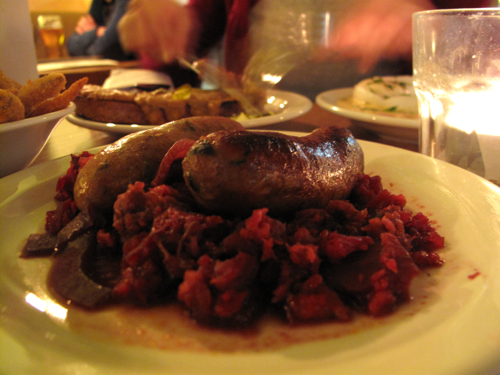 Their Wild Boar bangers were wonderfully comforting with a smokey, gamey flavour. Lovely with the rustic and sweet beetroot mash. I must warn you though – service here can be incredibly erratic. On the busy Friday night we visited, it took more than 15 minutes to seat us down despite us having made a reservation. In that time, we had one of the staff tell us our table was being cleaned, only for another to give it away to someone else. We were then given the worst table in the house (the one beside the swinging doors, exposed to the bitterly cold winter draft). Thankfully, one of the other waitresses (we think her name was “Dixie” as indicated on our printed bill) stepped in to save the evening – apologising for the mix-up and offering us a much better table that just freed up. She could sense our discontent and speedily took our drinks and food orders, keeping us happy for the rest of the evening. A-rated service which more than made up for the mayhem of before. I’ve since dropped by a couple more times for evening drinks (albeit at less busy times) and left a very happy boy on both occasions. I mean, what’s not to like about a place that does more than 50 beers? Bring on more artisanal beer pubs I say! p.s. If you are visiting anytime in the next couple of months, do sample the Chimay White they currently have on tap. It’s a delicious Trappist Beer with subtle notes of honey, banana, lemon (and a whopping 8% ABV).